Life-cycle events and other services available to those who are not affiliated with Or Ahavah. Rabbi Deb is available to those who are not members of Congregation Or Ahavah for life-cycle events including all kinds of weddings, commitment ceremonies, memorial services, funerals, Bar and Bat Mitzvah training and ceremonies for teens and adults, and baby naming ceremonies. Each service is designed especially for the people involved. 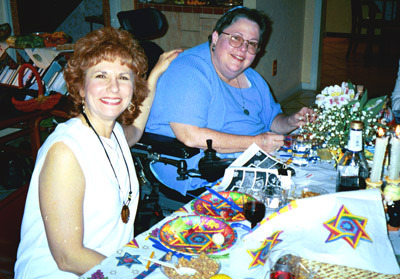 Rabbi Deb has done extensive work with Jewish adults who are partnering or who already have partnered with someone from a different religious background or who are in a same-gender relationship. The content of ceremonies ranges from traditional to creative and eclectic. Rabbi Deb also leads private Shabbat services, Jewish spiritual healing services, and other services that mark a special occasion such as Croning and New Moon ceremonies for private gatherings of friends and families.